*Note: Portions of this post first appeared on the Cali Fabrics blog. I’m super excited to share this dress with you. It’s one that I’ve dreamed about for a while and I’m happy to see it come to fruition. It turned out even more delightful than I expected, with little vintage details that turn what could have been a plain dress into an interesting frock. This dress was inspired by one of my favorite films — Brooklyn. 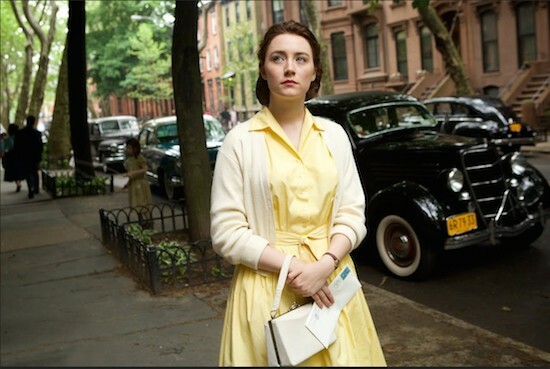 The film takes place in the 1950’s and the main character — Eilis — wears a gorgeous yellow shirtwaist dress in many of the scenes. I love shirt dresses and 1950’s silhouettes, so I decided that it was a great time to sew my own film-inspired dress. I used Simplicity 1459, a shirt dress pattern that I’ve had success with (my other two versions are here). For my third iteration I chose a yellow stretch cotton broadcloth which worked wonderfully for this dress. It’s not exactly like Eilis’s dress, but my look is inspired, not a literal interpretation. I made the sleeveless version of this pattern and left it unlined (I’m wearing a light cotton petticoat with dress). I finished this just in time for our trip to NYC and as it was super hot and humid in the city, I’m happy that I didn’t make the bodice too fitted. I made a self-fabric matching belt for this dress which really pulls together the entire look. I thought about using a covered buckle kit, but I had this vintage bakelite buckle in my stash which matched perfectly, so I went with that instead. Slide buckles aren’t exactly my favorite as I tend to fiddle with them and adjust them throughout the day. I made sure to make the belt longer so that I could tuck the end in. I added piping to the lapel, collar and button band, which proved to be a little bit of a daunting task due to the notches on the lapel. I ended up altering the notches to work with the piping, which I think works so well with the solid color of this dress. I had some beautiful yellow floral buttons picked out for this dress, but when it was time to sew them on, I decided that they competed too much with the other details of this dress, so I went with covered buttons instead. I graded this pattern up to about a size 26. The only alteration I made was a swayback adjustment to the back bodice. Admittedly, I probably did a little too much of a SB adjustment…. I kept the length of the skirt, which is a little shorter on me than a 1950’s skirt would normally be, but I like this length as it fits the contemporary retro aesthetic that I gravitate towards. This dress was a joy to sew and fun to wear. Sadly, I didn’t wear it to Brooklyn while I was in New York, but I did sport it in Little Italy, SoHo, Battery Park, and on the Staten Island Ferry. I guess we were too hot and too busy to take a photo. I wanted my husband to take a pic of me on the ferry, but it was so crowded and annoying that I didn’t get one in. We also went to the Museum of Jewish Heritage that day and viewed the Hedy Strnad exhibit: Stitching History from the Holocaust, which was an amazing and powerful exhibit at one of the best museums that I’ve ever toured. Disclaimer: I received the fabric for this dress at no cost as I am a Cali Fabrics contributor. These are my honest thoughts and opinions. I’m looking at making Simplicity 1459 – a reissued 1950s shirt dress, with fitted bodice, wide collar and full gathered skirt. My measurements of bust 45″, waist 40″, and hips 52″, put me in the largest size (give or take!). My high bust is 40″, and I’m in a bra of 38″/40″DD… My normal thought would be to take the size 18, and do a FBA of 2.5″ on both sides, giving me a total extra of 5″ across the bust. This coupled with not sewing the back darts (2 at 1″ each) and reducing the front darts from 1.5″ to 1″, would give me an extra (5″ plus 3″=) 8″ at my waist, which would resolve my waist of 40″ versus the size 18’s waist of 32″. The gathered skirt would negate the need for hip adjustments. I’d also use the standard size 18 sleeves without needing any adjustment there. I’d probably have to shorten the bodice at some point, too. In practice, would it be simpler/more stylistically in keeping with the pattern to just go for the largest size, 24, with bust of 46″, waist of 39″, and hips of 48″ and then narrow the shoulder down? The waist, with the design and wearing ease, would fit over my waist; as mentioned, the hips would not be an issue due to the gathered nature of the skirt. There would be room for the full bust; I’d just need to narrow the shoulders (to an 18 and then perhaps a smidge more as i do have narrow shoulders). could you talk me through which i should do, and why I would or would not do it? I’m having a ‘physics’ moment (ie. it makes sense at the point it’s being explained to me, but thereafter i’m at sea again). Oh wow I love this! That colour is just wonderful on you too. Can I ask, have you ever worn this with a cardigan or similar? I have one of these almost done but I stopped because I couldn’t decide whether to put on sleeves or leave it sleeveless. I like it more sleeveless like yours but I also would like to be able to wear it to work, where I definitely need sleeves or else a cardi to battle the airconditioning. I found the collar made any and all tops look just silly, so the dress is still sitting unfinished until I figure out what to do with it. Thanks, Kate! I haven’t worn this particular S1459 with a cardi, but the other two I made with this pattern (both sleeveless) have been worn with cardigans and they work just fine. I haven’t made a version with sleeves yet. It’s gorgeous! I love the color and the details! I saw that movie just a week ago, with my friend Clare who also sews. She and I were going nuts. “Oh, I LOVE THAT SWEATER!” Then five minutes later, “OH I LOVE THAT DRESS!” We couldn’t get enough. I’ve started to watch movies for the clothes. Thank you!! Yes, that movie and all of the clothes in it are to die for! I especially love how she wears different pieces again and again and alters each look with accessories. That color is perfect on you! Brooklyn is a fantastic movie, you have paid a lovely homage. Thank you, Lety! I’d love to make another dress from the film in the future! This dress is so vibrant and gorgeous, I love the notch collar (I’m too scared to attempt one) it looks great on. Thanks, Lynsey! The notch collar isn’t so bad too make. Just make sure to grade the seams and trim closely around the notches. You can definitely do it! Ooh I bought this pattern on the spur of the moment but I’ve been too afraid to try it! Yours is simply divine! Thanks, Melissa! You should make one!!! It’s not that difficult and has good instructions. Thanks, Carlee! I think the bees go well with it. 🙂 I wore it the first time with pineapples.